I discovered my instability, found the part, installed and shocked myself with the results! Tugging and prying gently on the barrel and eyeballing carefully, I could see the receiver was rocking. This lead to vertical stringing (as shown in previous post) until the rifle settled in. Not acceptable. 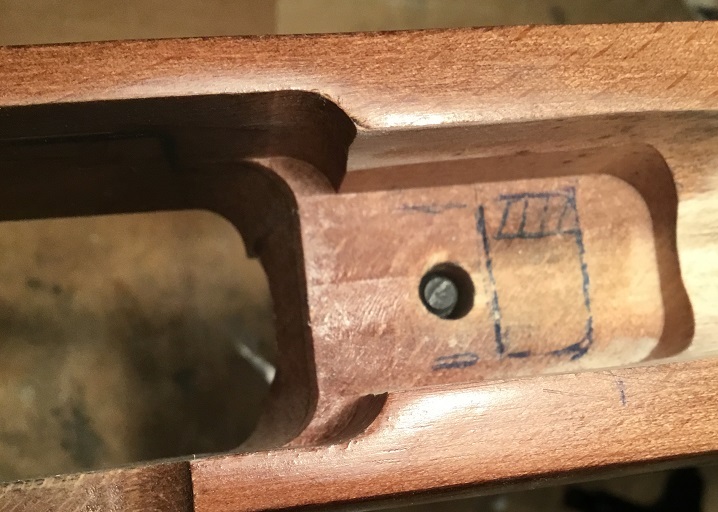 On careful examination of the area of the birch stock around the takedown bolt, I could see an impression of the front mounting tab of the receiver AND part of the V block. OI! That's not proper! I don't want the v-block rocking on wood! I sketched in with a pen for clarity the areas that probably would not have photographed well. First task- remove about 1/16 of an inch in the area under the V-block with dremel tool and Exacto chisel. On closer examination and thought, I was not pleased with the flexible nature of the receiver (aluminum) fit to the squishy birch stock so I ordered a Raven Eye flanged beddng pillar. $12.60 delivered. Life would be easy if I had access to a lathe, but then I would just want an end mill and.... I just spent the money. To install the flanged bedding post I used a 3/4" and 7/16" flat bladed boring bit and an inch of 1/4" nylon spacer tube that I cut a short piece off to make a pilot for the drill bits. I just slipped the nylon spacer over the tip of the drill bit, and it kept things centered better than I had a right to expect. Just worked slow and careful. What would be my next logical step after getting a big target scope? New quality barrel with fussed over chamber? 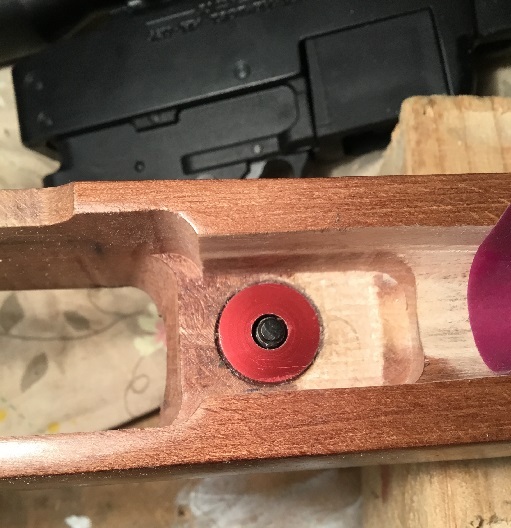 I loogied the takedown bolt with Vaseline and screwed that in to the threaded nut at the bottom of the stock. I think it's called a "escutcheon". Five minute epoxy was mixed up and a thin layer painted in to the hole in the stock, then phenolic micro balloon filler was mixed in to the epoxy (to increase strength and decrease exothermic heat) and glooped on the bedding pillar. Squish in to place, use steel rule to make sure its a nice few thousandths above the wood, clean excess goo, let it dry. Not too shabby. 1. The receiver would not rock. It was surprisingly solid. 2. The barrel was now slightly higher in the stock, so I reverted to bicycle inner tube for my shim just ahead of the v-block. The inner tube was about 0.015" thicker than my latex. Yeah, but would it work? The group on the left was a rather poor group of 10 using Aguila High Velocity, which I had determined to be the best for this barrel. 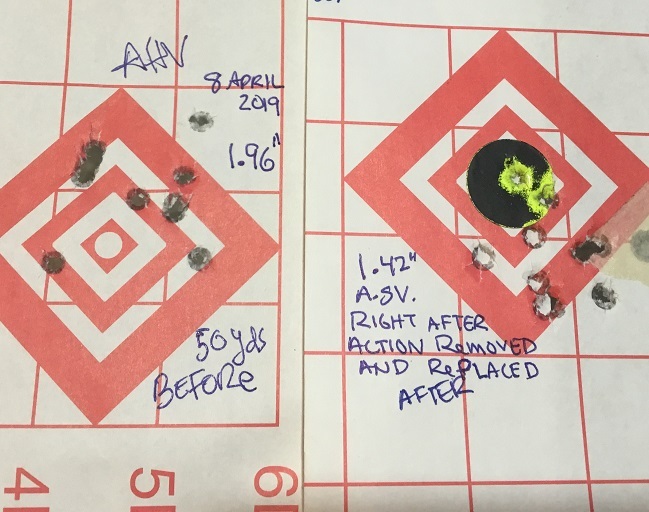 The one on the right was with Aguila Standard Velocity because I didn't want to waste the good stuff on what I expected to be an exercise in re-zeroing my scope. HUH. Cripes, maybe I got really lucky or the bedding pillar is really doing it's job. I think a little luck and a lot of "screwing aluminum to aluminum with less slop in the mounting hole as well seems to be beneficial to solid fitting" is going on here. As my ol' Dad used to say "It's better to wonder why something is working than wonder why it's not." This worked. Why then, did I think the Aguila High Velocity was the best ammo? 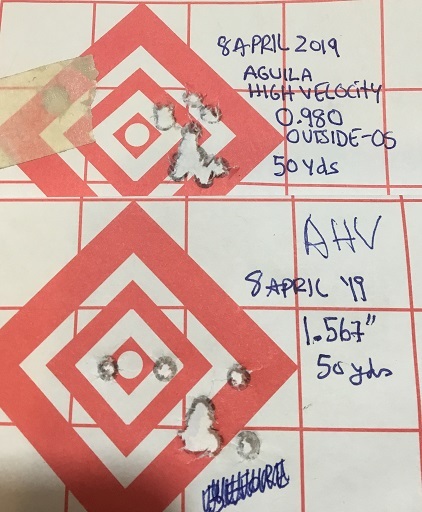 Because 10 shots, 50 yards, 0.980" group is why. The group below is also 10 shots... six in that little ragged hole. What about CCI? Previously I had determined that I could not tell the difference between this lot of Blazer and my lot of CCI SV. My 10/22 doesn't seem to care for it much but my CZ loves the Blazer. That icky string of MiniMag was repeated later... and it's the ammo, the follow up shots with something else yielded a round dispersion. I added a BX trigger for $53. 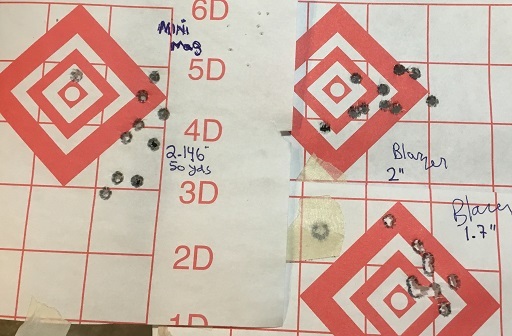 As shown from previous groups, the improved trigger doesn't add to the accuracy, but it makes shooting the groups a lot less work to maintain smooth trigger pull. It's not like the 4oz trigger on my russian target air pistol, but it's also not more expensive than the whole rest of the rifle combined. Group size: .980" at 50 yards, outside edge of hole- outside edge. 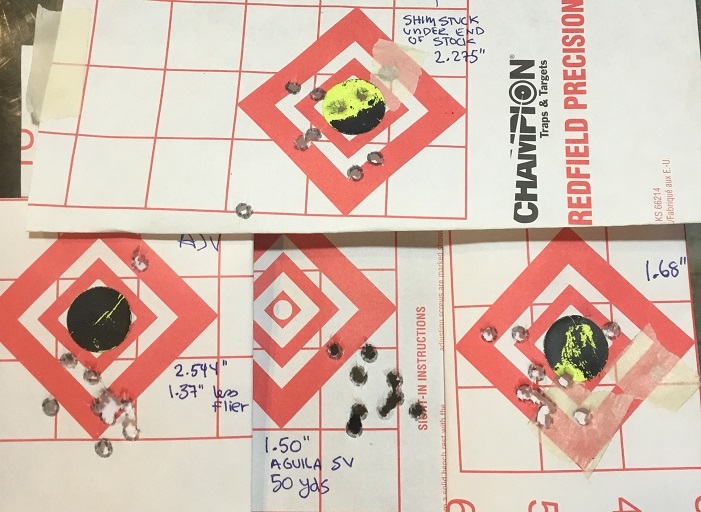 Basically, I spent $100 on upgrades and reduced the group size from 3.675" at 25 yards to 0.980" at 50 yards. Roughly... 7 inch groups shrunk to 1". Okay, maybe 1.6" to be brutally honest. Did the winds today have an effect? I dunno. The range is very sheltered but I could see the winds swirling in every d***n direction. I am stuck now. I've been able to get several groups that are roughly 1" at 50 yards. To take that to 1/2" is clearly the tough, slow, expensive part. Lemme think on this. I'm learning a lot and having lots of fun... but my CZ 455 American out of the box still outshoots this thing, and I haven't even tried the .17 barrel yet. What would I do next? New barrel with carefully bored chamber? Yes, I read it. But since the claim is that the most important thing is "trigger pull" .. and I just clearly proved that is incorrect... optics are the most important thing. My vertical stringing was due to bedding, not barrel break in... Poor bedding also explains a lot of the instabilities on that thread, too. Without good bedding, every assembly/disassembly is going to be unstable and that would explain a lot of the confusing results on that page. Take it apart, put it back together, and see if it still shoots. The answer is "nope." Groups are statistically significant like the square of their number... so... groups of 3 are like what you might get shooting 9... groups of 5 are like shooting 25 and groups of 10 are more like what you might get shooting 100 shots. I can't see much validity to shooting groups of 3 at 100 yards where wind is a factor in the inches category. I'm shooting some ragged holes... until you get to shots 5-10 with a stock rifle.... because luck. I don't believe dunking the barrel in liquid nitrogen showed any changes that were not also shown by assembly/disassembly. I don't believe in cryo magic other than stress relieving and banging with bullets or a rubber hammer does that. 10 shots under an inch at 50 yards for $310... maybe that's pretty good. Last edited by Stinkeypete; 04-09-2019 at 12:15 AM.